← 2012 Knoxville Double ride report part one: But I thought you said the ride went well? Who wouldn’t want to do a race where you get to pick a totem that’s then yours for life? I think that Chris Kostman is simply a brilliant man. 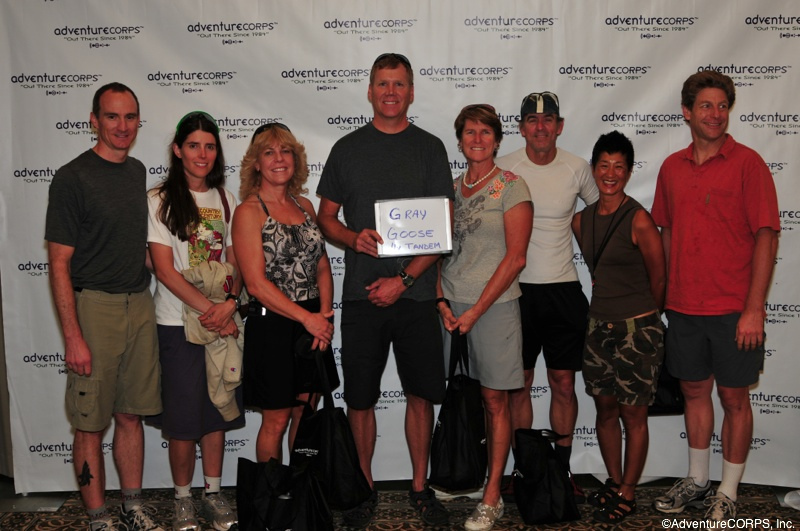 The Furnace Creek 508 is a five hundred and eight mile bicycle race across the desert, through Death Valley. The race is very popular. (Popular, not in a Levi Leipheimer-Gran Fondo sort of way, but in a 508 mile race across the desert sort of way.) It is also quite expensive, not just because of the race fees, but because of gas, lodging etc in such a remote location. I am not complaining about the costs, just pointing out the costs of a race that has been going on for over twenty years, is very popular (this year’s race had 234 racers and a sundry crew) and involves riding five hundred and eight miles across the desert. Who cares how expensive it is? You get a freaking totem. Who cares if it involves driving a car at cycling speed for five hundred and eight miles across the desert? Totems are cool. The other brilliant part of the 508 is that you can do it as a relay. Signing up for a five hundred and eight mile race across the desert as a soloist is something that only really strong and fast people do. Regular cyclists don’t do things like that. However, most cyclists can do 1/4 of five hundred and eight miles. The relays are a hook. A bit of a taste and then people want to try for the whole shebang. Not only do you get your own totem that you can keep for life, you can also be inducted into the 508 hall of fame after 5 events. Willy just completed his 4th 508: once as a soloist, once as a two man relay, once as a two tandem relay, and now once as a 4 tandem relay. He is definitely going to do one more event just to get into the Hall of Fame. In order to be inducted into the California Triple Crown (CTC) Hall of Fame, one needs to complete 50 doubles. 50. At my rate of double riding, for me to get into the CTC, I am going to need to find me some strapping young man to pull me around on a tandem as I pedal into my dotage. 5 events is awfully tempting and who on earth would want to do all 5 events as a soloist? (There is an answer for this question. You can look it up.) You would want to do some of the events as a relay and then you would be looking for fresh blood and hooking a whole new set of cyclist into the 508 web. Which is how Jason and I got involved in the 508. I love riding in the desert. 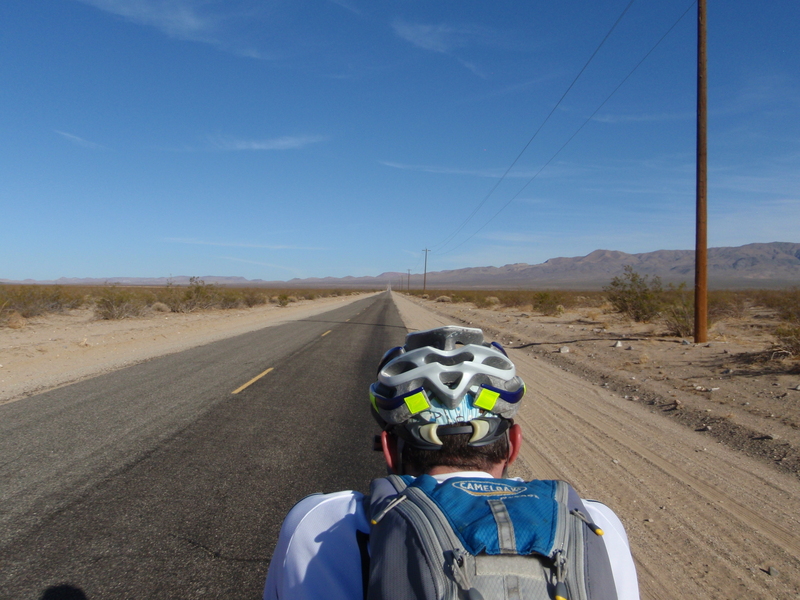 Jason and I have done the Death Valley century/double a few times and I love riding there. I ride along and can see forever. The roads warp and warble and disappear into points on the horizon. The land is vast and open. Geology is on display like a textbook. Mountain ranges miles and miles away seem close enough to touch. It feels surreal and other-worldly. I sign up for the Chris Kostman’s Death Valley double every few years, after the terribleness of the 9 hour drive has been forgotten, but the memory of the desert’s beauty still lingers. I love these views of the road disappearing into the horizon. When Willy mentioned the tandem relay, it sounded like a great idea. We would be involved in this cool race in the desert with a lot of people we know. It would be pretty and it would not be that hard, since 508 divided by 4 is not that much. Not until much closer to the race did I actually think out the situation. While the cycling would be fun, most of the ride would be done in a car, traveling at bike speed across the desert and while I like cycling in the desert, I cannot say, in all honesty, that I like driving across the desert. And where would I get to pee? I have to admit the 508 sounds awful but that is just me. Not my cup of tea at all. I have heard that some people like that sort of thing though. … I think it would be fun to get 4 tandem teams together in Death Valley and ride 60 to 80 miles in the daytime together. Then go to the hotel for drinks and dinner. Maybe a hot tub soak. Repeat the next day. I’m just saying. Mark is awfully fond of hot tubs, but I still think that he might be onto something. The driving turned out to be fine. Driving wasn’t as nice as riding, but it was sort of fun to drive along slowly across the desert and stare at the horizon. Willy wrote to us in March and told us to get hotel reservations at the start and finish sites. He warned that the rooms would be hard to come by as the event approached. Jason and I got a room at the start host hotel, but were unable to get a room at the finish host hotel and so got a room at the Motel 6, which Willy had mentioned in his email. Nancy was really on the ball and managed to snag a room at the finish hotel. On August 30th, having completely forgotten about his March email, Willy wrote to us again and suggested that we should all get rooms. He hadn’t looked into getting rooms yet, and was hoping that rooms were still available. Nancy and Jason replied that we had already reserved rooms. Willy, Steve and Tim were unable to get rooms at the start hotel, but they decided to get rooms at the Motel 6 for the finish since Jason and I were booked there (on Willy’s suggestion). That motel 6 was pretty much a dump. When we got to the motel, Willy told us that he would never have stayed there, except that we had already gotten rooms there and he decided to be a team player and book his room there, too. We had only stayed there on his suggestion, of course, but that was from an email he had long forgotten. The Motel 6 wasn’t really that bad. It didn’t have bed bugs, roaches or obvious scurrying rodentia and it was really, really cheap. I haven’t stayed in a room this cheap in over 15 years. Our room was dinky and smelled faintly of urine and cigarette smoke, but only faintly. All in all the room was great; it was cheap, it had no bed bugs or roaches and you acclimated to the smell in a matter of minutes. Nancy showed up at the finish hotel, to discover that her reservation was for a different day. After a few calls, Deb was able to find a room in town for them. Their room, apparently, did not smell of smoke and urine, but it was more expensive. The start host hotel, the Hyatt Regency in Valencia, was fantastic. The rooms were reasonably priced and very, very nice. We rode under the totem Gray Goose, which is a great totem, since it is a combination of Julie’s and Steve’s last names and they are interested in doing the ride as a solo tandem team or a 2-man relay. Floyd Landis had been signed up as part of a 2-man team and people were somewhat relieved that he was not able to come, so that the attention would be back on us regular folks. Deb and Willy have ridden the tandem together quite a bit and they did last year’s 508 as a 2 tandem relay with Steve and Julie. They were our honored veterans. Jason, Tim, Nancy and I were the clueless rookies. Jason and I have ridden quite a bit together, though we don’t ride as much as we used to do. Nancy has ridden tandems on numerous occasions with various captains, though she, herself, does not own a tandem. Tim was the odd duck. The two stages of the 508 were his 4th and 5th rides on a tandem. He signed up for this event, having never ridden a tandem at all. 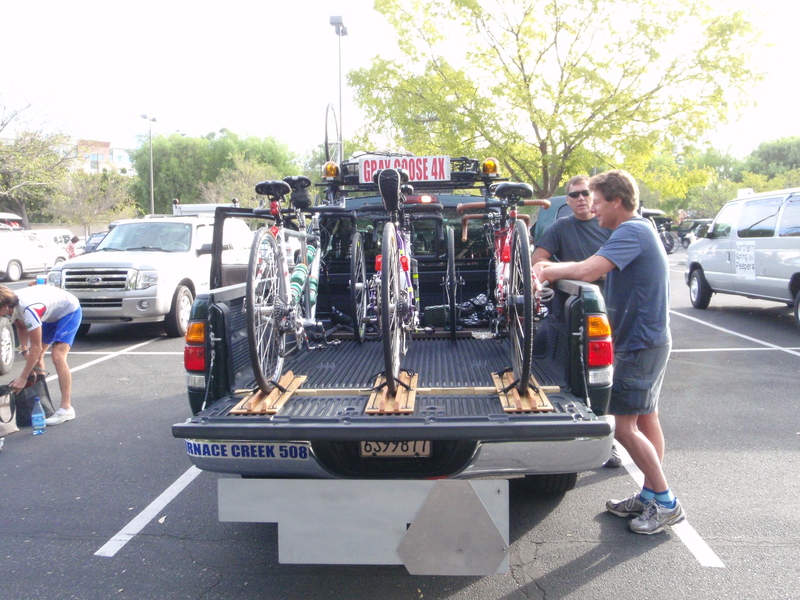 He signed up to this event with the understanding that he would buy a tandem in order to do it. I know couples who have been married for years, but are unwilling to get a tandem, so worried that they might not like it and he bought one, because he was riding with Willy on a brevet one lovely day and Willy told him about the tandem relay idea and Tim thought it sounded fun. He agreed on the spot to sign up, buy a tandem and ride with Nancy. Who does that? Nancy’s willingness to ride a tandem with someone she did not really know is remarkable, too. All in all, the team was great, except for me, who has a slight tendency for baseline crankiness (especially when hungry and I missed a couple of meals on this weekend due to ride timing). No one got upset or seemed stressed out and everything went smoothly. 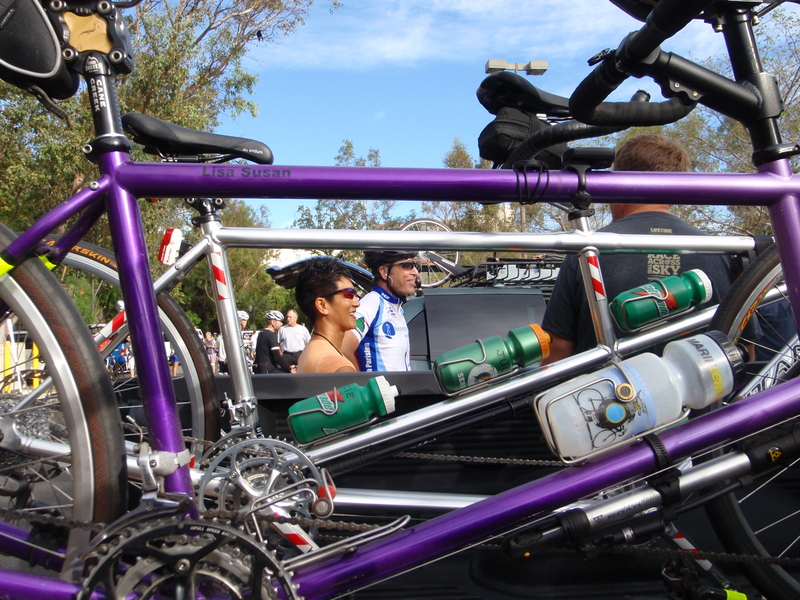 Steve made a rack so he could carry three tandems on his truck. Willy has a van decked out from previous 508 events for supporting this type of event. Willy was on one of the support teams that crewed for Joan Deitchman this year in RAAM. Willy is of the opinion that you can only plan so much for these events. His main plan is to be flexible, because you never really know what is going to happen. Willy drove Tim, Deb, and Nancy down to Valencia, but between the four of them, they failed to adequately clamp down the skewer on Tim’s brand-new tandem and the tandem fell over on the roof as they drove down Interstate 5. Fortunately, it did not fall off the roof or into some other unsuspecting driver’s window. They stopped, put the tandem back into place, and everything was fine. Jason and I arrived at the start hotel on Thursday evening, got nice and settled and then went for a nice ride on Friday morning. We wanted to get there early, so we would be all settled and comfortable before registration on Friday, which started at 11 am and ended at 4 pm. Willy, Nancy, Deb and Tim arrived in time to finish registration 3 minutes before 4. Jason and I did get a very nice ride in on Friday morning and I was very happy that we had arrived early. 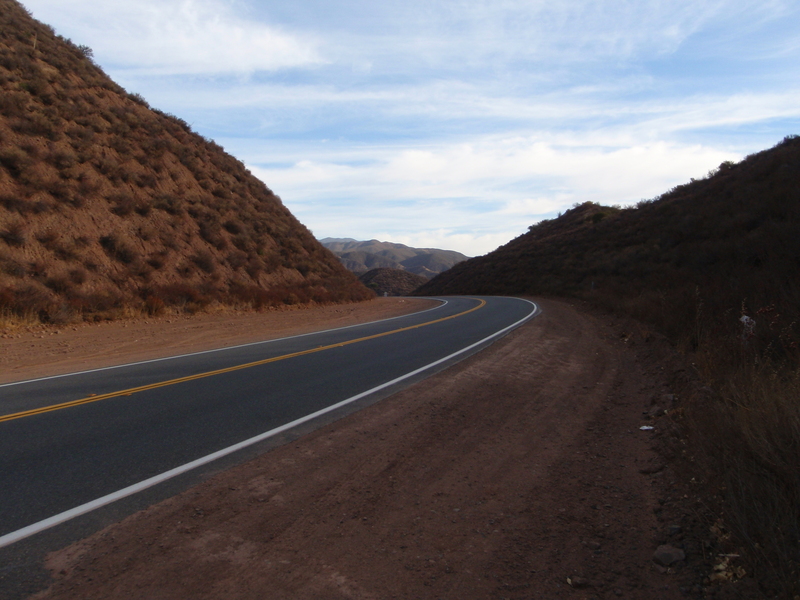 Valencia was a bit odd, but we were able to ride the first bit of stage one, going through San Francisquito Canyon, which was very pretty and interesting. 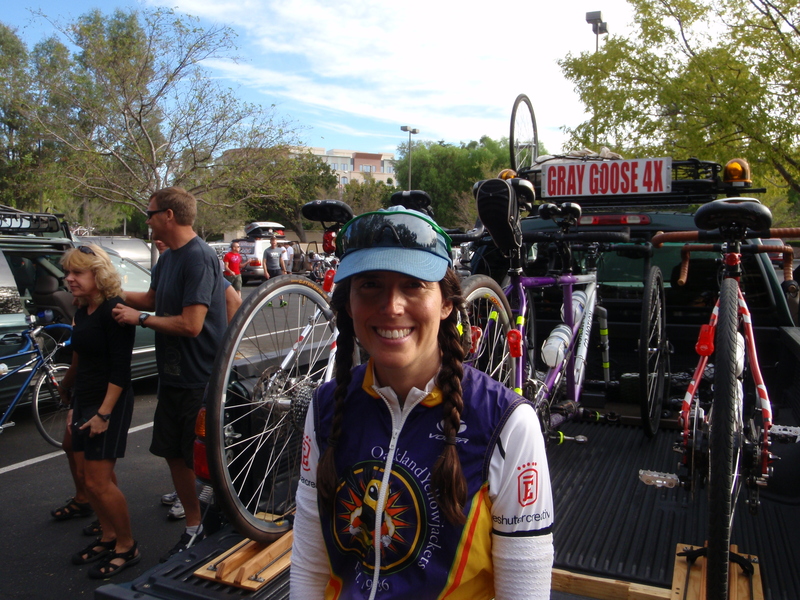 See Nancy Yu’s blog for the full Gray Goose Tandem 4x race report. Click here for Nancy Yu’s video of the weekend.